Everybody dance now - the Ideal Woman on the hoof in Don Quixote. Photos by Gene Schiavone. Okay, let's get the truth-in-advertising part out of the way: Rudolf Nureyev's Don Quixote, with which the Boston Ballet has had a long relationship - and which, in a spectacular new production, runs through the weekend at the Opera House - has almost nothing to do with that novel you may have heard of by that Spanish dude named Cervantes. In fact, much like the dreaded Man of La Mancha, it's practically an unintentional travesty of its source. The immortal Quixote gets his share of hard knocks here, it's true, but somehow Cervantes' satire of chivalric delusion never gains any traction, and the daft Don remains a noble dreamer to the end. Instead, Nureyev focuses on a young couple in love (whom I don't remember from the book at all) who, in pursuit of their nuptials, sometimes intersect with the delusional Quixote - but more often with hordes of townspeople, gypsies, and toreadors - who of course all want to cut a rug. The whole piece, like much of imperial Russian ballet, is at its heart a pageant, with all manner of divertissements broken up by the occasional pas de deux ( as well as some rather lame "rollicking" comedy and a few utterly random episodes from the actual novel). So there's not much to think about in this production (and the music, by Minkus, is pretty much free of ideas, too) - but frankly a whole lot to gawk and marvel at. For the Ballet is now packed with superb dancers, and in the lead roles of "Kitri" and "Basilio" on opening night we got two of the company's best, Jeffrey Cirio and Misa Kuranaga (at top), who feel a bit like a matched set in their light, twinkling precision. Cirio in particular had his adorability set on "stun," but you couldn't deny he aced Nureyev's tricky footwork with a seemingly unstoppable flow of sheer nimbleness. His lifts were less dazzling than his leaps, however - he still needs a bit more upper-body power; but is he even fully grown yet? ( I'm not sure.) Kuranaga was just as charming, if slightly more restrained, and she, too, was close to technical perfection, even as the ballet turned into a punishing obstacle course for her in its last act, with fouettés on top of fouettés, and a series of unsupported freezes en pointe. Meanwhile Carlos Molina (at left) brought a convincing commitment to the Don's dazed, stricken stare, and even some poignance to his ravishment by various visions of feminine grace (Dusty Button, as the "Queen of the Dryads," above, was perhaps the most convincing of these). But alas, as Sancho Panza Robert Kretz was all pratfalls and little loyal steadfastness (and for some reason he was a monk rather than a peasant), and we just didn't get enough of Paulo Arrais, who still made a skillfully funny sketch of Gamache, Basilio's competition for Kitri's hand. There were other brilliant turns, many from the women - Kathleen Breen Combes tossed off her "street dancer" with brio, and Adiarys Almeida, Rachel Cossar, and Olga Malinovskaya all had striking moments. There are a few intriguing eccentricities to Nureyev's choreography - he uses a male corps more often than you'd expect, and tends to arrange his background dancers in flat, moving friezes. But basically he goes for the money solo every time (although there is a subtler pas de deux at the top of the second act in which Kuranaga and Cirio conveyed a sense of private, rather than public, romance). Indeed, watching Don Quixote, you feel as if you're getting a glimpse into a grand, if somewhat empty, lost tradition - which I suppose has its own meta-resonance with Cervantes! And is grandeur for its own sake really such a bad thing, anyhow? (We may miss it when it's gone.) I should also note that the splendid sets were by Nicholas Georgiadis, and the atmospheric (somehow antique) lighting, drawn from a palette of burnt siena and umber, was by John Cuff. Through Sunday. I remember seeing the Don Quixote many years ago and being struck by how bland the music was and how peripheral the Don and Sancho are to the story. 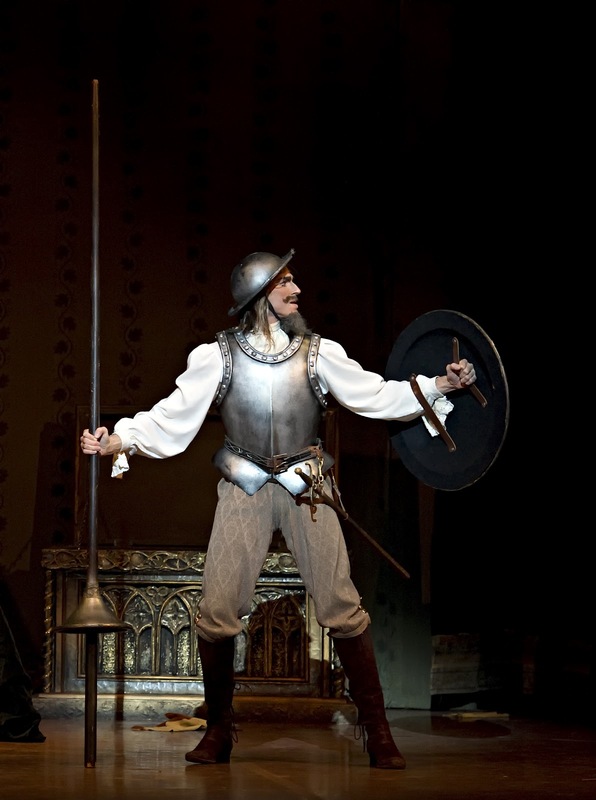 In that performance, Sancho was essentially a klutz, and if that's what he is in this production, I assume that's the traditional Russian approach to the ballet's scenario. Why the Don gets to be the title character I cannot imagine.